London is already affected by events such as floods, heatwaves and droughts, and as our climate changes we expect to see an increase in the frequency and intensity of extreme weather events. Those vulnerable people living in social housing are likely to feel the effects the most and so it rests with social landlords to ensure that their stock is adapted for climate change. Most of the social housing in London was not built with climate change in mind, which means that it will have to be adapted to suit our changing climate. Many adaptation techniques are available but have not been tested on a large scale on social housing before now. This report explores the findings of such a large-scale test and examines the particular situation for social landlords. 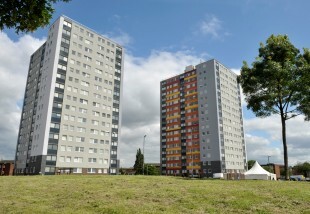 The report focuses on the Colne and Mersea blocks in the London Borough of Barking and Dagenham (LBBD). These two blocks, comprising 200 flats, were scheduled for Decent Homes works and the opportunity arose to adapt them to climate change at the same time.